Listening to Malcolm Proud’s excellent rendition of Johann Sebastian Bach: Six partitas for harpsichord, Clavier Übung I, BWV825-830 (Maya MCD1301, rec 2012, 156’) felt very welcoming, almost like coming home. This has, of course, more than one reason. The pieces themselves are indeed very familiar and close to my heart, as is probably true for most keyboard players nowadays. The sound skilfully produced by Proud on a Ruckers copy is very warm, sensitive and versatile, and his interpretation, which generally tends towards reasonable if not moderate tempi, is very tasteful and appropriate, with just the right portioning of ornamentation and variation between repeats. Another reason, though, has to do with the recording technique. The soundstage in this recording is very coherent and the microphones are located and mixed in a way that places the listener at the player’s position, hearing the higher notes from the right and the the lower notes from the left. To a certain extent, the listeners are taken into a virtual reality where they can hear everything from the harpsichordist’s point of view. Being a harpsichordist, I felt very much at home in this setting and was absolutely delighted to experience Malcolm Proud’s angelic playing from this perspective. J.S. Bach Clavierubung III. Malcolm Proud, organist. III/51 Metzler/Dietikon organ (1992) of the Stadtkirche, Stein am Rhein, Switzerland. Maya Recordings MCD 0803. 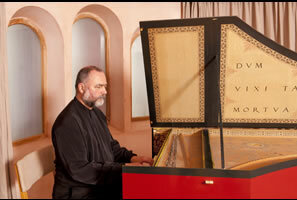 A former student of Gustav Leonhardt, Dublin native Malcolm Proud is active as both a harpsichordist and an organist. His natural affinity for early music is readily evident in these excellent performances of excerpts from Bach's Clavierübung III. Proud has chosen to present the large chorale settings with pedal (ten works), framed by the Prelude and Fugue in E-flat. His readings are distinguished for their stylistic integrity, conservative, unhurried, sensible tempos, clear, pronounced articulation that defines motivic and phrase structure without calling attention to itself, solid yet fluid rhythm, and well-chosen registrations. Proud combines technical control with musical sensitivity. To cite but two examples, he plays the plenum of Wir glauben all' an einen Gott, BWV 680, in a detached style that gives strength and solemnity. In Jesus Christus unser Heiland, he navigates the notorious leaps with well-placed agogic accents. The instrument, located in a favorable acoustic, is an ideal vehicle, with its clarity, transparency from bottom to top, incisive, balanced, and bold voicing, and pleasing color. An added bonus is the fine essay (in English, German, and French) by David Ledbetter, which addresses Bach's musical-religious philosophies, particularly those concerning numerology and symbolism. Though this is not a complete presentation of Bach's great essay on the chorale, it is beautifully performed, and a fine representation of current performance practice. The title of this CD is both factual and misleading. It includes all of Part III of the Ciavierubung we are accustomed to hear, i.e., the large settings of the chorale-preludes framed by the Prelude and Fugue in ?-flat. It does not include the small settings or the Duetti. For the latter, one can excuse their absence on the grounds that they were probably intended for the harpsichord. But to my mind, the small, manualiter settings are equal in mastery, and, perhaps, even superior in tone painting to the large settings, even though their relative brevity make them like cameos. Malcolm Proud is from Ireland and studied with Gustav Leonhardt. 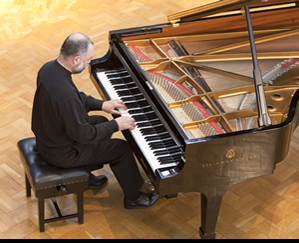 He is well known in Europe as a harpsichord and organ performer and has appeared with many of the leading early music groups. His playing on this CD is stylish and assured, and thus this makes a good version of the third part of the Ciavierubung for your library. The Metzler organ is quite beautiful in the usual meticulous Swiss manner, and well recorded. Malcolm Proud is an unfussy musician. If he were a chef, there would be little in the way of fancy nouvelle cuisine presentation. If he were an actor, there wouldn't be much in the way of histrionics. But Proud is also something of a musical visionary. His steady vision allows him to communicate music with an unusual sense of inevitability, giving the impression that he has captured and can convey the essence of what he's playing with unusual fixity. That's what he does in this 68-minute selection of 12 pieces from the third part of Bach's Clavierübung, played on the Metzler organ of the Stadtkirche in Stein am Rhein, Switzerland. The manner may be unassuming, but the rewards in music as great as Bach's, are rich. The Sunday at Noon series continued its March-April sojourn in City Hall with a programme of Baroque music showcasing Dutch soprano Lenneke Ruiten in songs by Henry Purcell. Her small representative sampling naturally favoured texts about longing, love and sadness in songs full of references to pastoral characters from classical Greek poetry and of thinly veiled sexual undertones. After a jolly opening with "Nymphs and shepherds come away", she went straight to the heart of the matter with "If music be the food of love". She did the third of Purcell's three versions, a great song, almost a mini-cantata with recitative- and aria-styled passages in a fantasia that is ever-changing in response to the words. Here and elsewhere, notably on the words "soft" and "sweet" in "Ye gentle spirits of the air" from The Fairy Queen , Ruiten's long, meandering melismas on a single vowel sound seemed to cross over from a vocal to an instrumental sound. The naturalness of her singing belies an excellent technique, which is seemingly effortless and without ostentation. Not a single moment was about her; it was always about the text. The highlight was "O solitude", sung over one of Purcell's favourite devices, the repeating bass-line or "ground". Ruiten's delicate strength unleashed the composer's "peculiar Genius to express the Energy of English Words" (as described by publisher John Playford), and made you marvel once again at how art can derive so much beauty from grief. Ruiten was expertly partnered on harpsichord by Malcolm Proud and on the seven-string bass viol by Sarah Groser. Both shone in instrumental interludes by Louis Couperin and Christopher Simpson respectively. Although an amount of detail was lost to the blooming resonance of City Hall, the overall sound quality was pure and immediate in a nicely conceived and beautifully presented concert. And in these works Biber created a range of highly distinctive sonorities through the use of the technique known as scordatura. Scordatura involves re-tuning the strings of the violin, which both changes the resonant character of the instrument (it's the open strings which speak with greatest resonance) and also enables the sounding of otherwise impossible or impossibly awkward combinations of notes when chords are played through double-stopping. The range of tunings involved is so elaborate as to require multiple instruments for concert performances, and, to the best of my knowledge, seven sonatas using four different violins is as many as baroque violinist Maya Homburger has ever dared undertake in a single programme. The music is rich in symbolic connections. Some stem from associations which are purely musical. Others greet the eye when the music is read - the Crucifixion Sonata opens with a motif that outlines a cross. And there's even a major one with an altogether firmer physical reality. For the Resurrection Sonata the middle strings of the violin are physically crossed at either end of the instrument (in the pegbox and beyond the bridge), and the combination of crossing and retuning also facilitates the playing of octaves in a manner that's unique in the literature of the violin. All this background would, of course, be of little interest if the music was not of high quality. Fortunately, Biber's musical inspiration was of a level to match the intricacy of his technical imagination. And the sonatas require a performer of exceptional gifts to speak with clarity and conviction to a modern audience. Maya Homburger, who presented what must surely have been the first all-Biber programme in Ireland during Kilkenny Arts Week in 1998, repeated the feat at St John the Baptist Church in Midleton for the East Cork Early Music Festival on Thursday, to mark the 300th anniversary of the composer's death. Homburger has a sure grasp of Biber's musical logic, an alert sensitivity to the extraordinary sound worlds he created, and she seems finely attuned to the deeper suggestiveness of the music, a suggestiveness which is, above all, what makes these pieces so treasurable. Whether dealing with the overt lament which opens The Agony in the Garden, the sense of subterranean disturbance that's to be found later in that same sonata, or the many flashes of finger-blurring virtuosity that are littered throughout these works, her musicianship always seemed true, her communication free and open. The accompanying continuo group, Siobhán Armstrong (double harp), Malcolm Proud (organ and harpsichord), and Sarah Cunningham (viola da gamba), rang the changes with imagination and matched the soloist in bringing these extraordinary works fully to life. occasion, Wilbert Hazelzet (baroque flute) from Holland, Maya Homburger (baroque violin) from Switzerland, Marja Gaynor (baroque violin and viola) from Finland, and Sarah McMahon (baroque cello) from Ireland, joined Proud for a mind-blowing performance of Bach's miraculous Musical Offering. Despite publishing many transcriptions (for piano) of music by JS Bach, Harriet Cohen, one of the leading pianists of mid-20th century England, was reputed to have dismissed his oeuvre as 'sewing machine music'. From Proud's majestic Ricercar a 3, played with exquisite phrasing and balance on the School's mellow-voiced harpsichord, through to the final Canon Perpetuus, this music just grabbed the listener's attention and never let go. My favourite movement, the Trio sonata for flute, violin and continuo, almost made me believe that I had died and gone to heaven. These exquisite sonatas are a prime example of the inspiration that Vivaldi had for the violin as an instrument of supreme expression. Hyperion has managed another winner with Elizabeth Wallfisch and Malcolm Proud on consistent top form throughout with the delightful addition of Richard Tunnicliffe on the cello in some works. Each sonata is a delight to the ear and in some places I found myself wishing to dance around to the energetic music! I greatly enjoyed the D minor Sonata which is truly one of the most beautiful in this collection with an expansive Andante Prelude and a dashing Gigue that concludes proceedings in whirlwind fashion. However one cannot really single out one sonata from the other as all reveal a certain level of delicacy, beauty and mastery. Wallfisch is born for this type of repertoire, and as expected she turns out impressive and highly authoritative performances throughout. Tunnicliffe is the ideal complement whilst Malcolm Proud accompanies with knowledge and sensibility creating a salon atmosphere that is quite authentic. The recorded sound is pretty much excellent and the baroque violin enthusiast would obviously need no hesitation to snap up this gorgeous collection. What could be better or more enticing than a brand new performance of the Cantor of Leipzig's 6 Brandenburg Concertos by one of the greatest living interpreters of his music, Sir John Eliot Gardiner? We have waited a long time for Gardiner to get around to these core works of the baroque repertoire, but the wait was well worth it. Sir John and the handpicked musicians of his English Baroque Soloists give us well nigh flawless renditions of these concertos. The instrumental virtuosity in his renditions is sometimes simply breathtaking. The solo piccolo trumpet of Neil Brough in Concerto No. 2 is a case in point. Brough races up and down the scale with total ease, in the process concealing the notorious difficulties inherent in that instrument. Similarly, Malcolm Proud dazzles in the harpsichord solo of No. 5 and Jane Rodgers embraces us in the warmth of her viola playing in No.6. The listener never once winces at the sounds made by the outstanding musicians that comprise the EBS as they recreate this music in a manner Bach would have probably recognized. It has to be said that for this collector I sometimes feel that the music could perhaps do with more rhythmic verve. Gardiner's Bach is not of the rough-hewn foot-stomping variety. But this is a minor quibble and for many a matter of taste. For anyone wanting, or deserving, a fresh new recording of the Bach Brandenburg Concertos this beautifully packaged set – no plastic here – fills the bill perfectly. Review from The Washington Post :The Classical Beat June 2010 – Brandenburg Concertos/John Eliot Gardiner English Baroque Soloists: Malcolm Proud harpsichord soloist in No. 5. "What more can a conductor do with Bach's Brandenburg Concertos these days? John Eliot Gardiner's answer is to do less: He actually conducts only Nos. 1 and 2, the most "orchestral" in fabric. The rest are led by English Baroque Soloists leader Kati Debretzeni - except for No. 6, since she is a violinist and that concerto contains no violins. These Brandenburgs sound first and foremost like dance music - delivered with impeccable phrasing and a sure sense of style. They abound in joie de vivre and are filled with instrumental touches inspired by the musicians' creativity and understanding. In No. 1, for example, the horns are intrusive among the more "refined" instruments of their day - to the point of raucousness, especially in the first movement. This produces an unusually bright and bubbly performance of this most suite-like of the Brandenburgs. What stands out in No. 2 is the outstanding balance within the odd instrumental combination that Bach created - violin, recorder, oboe and high trumpet. No. 3 is a tour de force for strings, with a finale that positively gallops without ever seeming rushed. In No. 4, the lilt of the two recorders has remarkable lightness and delicacy. No. 5 is handled with rare intelligence, not as a soloist-focused harpsichord concerto but as a chamber piece in which the harpsichord is first among equals for a time. And No. 6 is a marvel, its dark hues never eclipsing the dancelike rhythms of the music and the fascinating interplay among viola, cello, viola da gamba and violone. Considering his vast experience as a Bach conductor, it comes as a surprise to find that Sir John Eliot Gardiner has not recorded the Brandenburgs before. But then, as he asks in his booklet-note, "what is a conductor to do in this repertoire?" Well, quite. Since period instruments brought with them increasing acceptance that this is really chamber rather than orchestral music, recordings in which the director has not been among the instrumentalists have grown fewer. In fact, Gardiner only conducts Nos 1 and 2 here, these being the grandest; for Nos 3-5 he yields the stage to the English Baroque Soloists's excellent leader Kati Debretzeni, while No 6 apparently has no director at all. Gardiner's role in these, he says, was "to facilitate and encourage", to"give the players some feedback", and then to sit in the audience. Nice work if you can get it, you might think, but actually these performances are recognisable enough as being in the Gardiner mould. There is the usual clarity of texture and detail; few accounts of Nos 3 and 6 have such chiselled edges and unobtrusively assertive inner parts. The dynamic contours are strong and meaningful. Tempi are brisk, and while they are not hard-driven in the way that they might have been 20 years ago, the finale of No 2 charges to a startingly abrupt finish. ?More recent Gardineresque trends can be observed in the tender care?taken to characterise the various episodes in the finale of No 1, or in?the wisdom and freedom with which he seeks out, but does not overplay, latent bass-line hemiolas in the third movements of Nos 1 and 3. Indeed, the controlled skill with which the joy of such movements is communicated by Gardiner's players - with Debretzeni, trumpeter Neil?Brough, recorder-player and flautist Rachel Beckett and harpsichordist?Malcolm Proud among the soloists - is one of the greatest pleasures of this set. The recording, made at concerts in London and Paris earlier this year, is lucid and democratically balanced but may strike some as a touch dry, while the act of splicing together live performances may be the?reason for the odd little tempo shift or bumpy edit. Some may prefer?the smoother-lined and more spaciously recorded accounts of these works given recently by Richard Egarr and the Academy of Ancient Music? (Harmonia Mundi, 6/09). Some may not. But these are undeniably Brandenburgs of flair and understanding. Lindsay Kemp. The Da Camera Society of Mount St. Mary's College presented the U.S. debut on Tuesday of the Chandos Baroque Players in the ornate Viennese Room of the Ritz-Carlton Huntington Hotel in Pasadena. And, hardly for the first time in its 20-year history, Da Camera came up winners, as did the large, appreciative audience. The seven-member ensemble, playing on period instruments, didn't give us style by the numbers but an evening of music-making richly varied in performing styles. The program bookends were works in the French manner by German composers: first, the handsome "Paris" Quartet in E minor of Telemann, and finally, the hyper-familiar B-minor "Ouverture" of J.S. Bach, sounding fresher than usual not only for being played one instrument to a part, but for the intense, French-with-a-vengeance double-dotting of its first movement and the aerial grace of the ensuing dances. Corelli's noble Trio Sonata in A was a showcase for the agile fiddling of Maya Homburger and Sarah Bealby Wright, and the full string ensemble-- further including violist Rosemary Nalden, cellist Daniel Yeadon and bassist Barry Guy--gave us Purcell's mighty Chacony in bold colors and with tremendous rhythmic urgency, rather than as the respectful dirge less perceptive executants tend to make of it. The sight of Bach's Fifth "Brandenburg" yet again on a program hardly makes the heart leap. But, to coin the cliche, the Chandos players' crisp, lively, unjaded delivery made it sound unexpectedly fresh. Malcolm Proud is one of those musicians who is set apart by virtue of his gift of rhythm. It's not a matter of correctness or, in the simple sense, of accuracy. It goes much deeper than that. It's as if, at least when the music is by Bach, he's gripped by some almost superhuman force. And the ineluctable constraints he experiences translate in his playing into an imposing, visionary inevitability. The single word that comes most immediately to mind is "momumental", reminding one of what all those critics and musicologists mean who like to draw analogies with architecture by talking of edifices in sound. And the third part of Bach's Clavierübung, music that often marries severity and grandeur, is territory where Proud's approach yields results of uncommon richness. 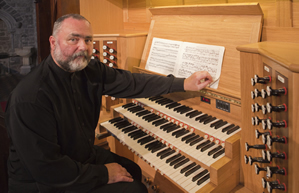 At St. Michael's Dun Laoghaire on Sunday, his selection of 10 of the 27 pieces that make up this collection included the great opening and closing prelude and fugue, four diverse chorale treatments, and the four duets. These last are bizarre, even credulity-stretching exercises, which Proud handled with an insight that made their paradoxically restrained extravagance thoroughly invigorating. "... these delightful new performances offer a mix of virtuosity and brio that is simply irresistible." Du point du vue musical, ces sonates sont remarquables et exigeantes, et Bach a eu recours à des procédés innovateurs et variés. Leur qualité expressive intemporelle constitue une puissance fondamentale. MAYA HOMBURGER, soliste baroque prisée, mais aussi connue pour son travail sur des improvisations ou des compositions contemporaines de Barry Guy, est une interprête sensible de ces pièces maitresses de Bach, relevées brillament par le claveciniste MALCOLM PROUD. "Maya Homburger and Malcolm Proud deserve a great deal of praise for their latest release. Their technical level and ensemble playing are exemplary. Homburger's flawless intonation and silvery, centred tone find their keyboard equivalence in Proud's sensitive attention to voice-leading. The disc is masterfully recorded in such a manner that the listener is treated to front row seats in a church with pleasing acoustics." "On this CD, violinist Maya Homburger and harpsichordist Malcolm Proud have produced a recording of outstanding beauty. Homburger exercises flawless judgement regarding vibrato and dynamic with clean, searing long notes. Proud's left hand fools you into hearing a cello part that isn't there, while his right dispatches rapid semi-quavers or wrings the soul in slow passages with equal ease and flexibility." Never too proud to acknowledge a debt to earlier masters, Bach himself was the icon for 20th century composers hooked on the idea of tradition. For them, in turn, the harpsichord's sound became a symbol of their period stance, a point nicely made at the Wigmore Hall on Tuesday, when Maggie Cole and friends framed an evening of modern works for the instrument with Bach's triple harpsichord concertos in D minor and C major. Also evoked was an evening, exactly a century ago to the day, when redoubtable harpsichordist Violet Gordon Woodhouse plus the Dolmetsch family, garbed in Elizabethan dress, gave a pioneering account of the C major Concerto by candlelight in nearby Upper Brook Street. So enclosed in the evening was a further fold of historical reference, with the programme stressing how modes of presentation, performance practice and authenticity remain constructive issues for today's early-music movement. With Malcolm Proud and Alastair Ross, Cole gave strong, clean accounts of the Bach, the ensemble only slightly faltering before the close of the D minor Concerto's slow movement. The C major Concerto, full of swagger and festive spirit, aptly closed the evening. The composer who bridged the centuries was not Bach, however, but Scarlatti, for all that Schoenberg found whispers of atonality in the German composer's music. It was very strange indeed, the two-movement Scarlatti Sonata in D, played by Alastair Ross, sounding dysfunctionally Spanish. Awkward silences framed splashes of wild flamenco colour; disjointed leaps and scrunchy chords were thrown together in ways that could have rivalled Poulenc. Hungarian Rock, by Gyorgy Ligeti, did something odd yet entirely right to conclude, dismissing itself with a phrase of ersatz folksong after pages of rhythmic hyper- activity. By contrast, Gavin Bryars' After Handel's `Vesper', though entirely predictable in rhythm, tickled the ear with chords that swerved to unexpected places, touching en route progressions lingering from half-remembered music, though whether by Bryars or other composers, baroque or pop, proved hard to ascertain. Cole played the Bryars on a delightful instrument that was emphatically not of the heavyweight, faux-Bach kind that proved popular earlier in the century. At one point a limpid right-hand tune was registered to seem like a twanging mandolin. For Manuel de Falla's pocket-sized Harpsichord Concerto she preferred a similar tone, definitely not of the kind that Wanda Landowska would have chosen at the work's premiere in 1926. Though in a sense inauthentic, the resulting lighter, magical sound of soloist and small ensemble led by Alison Bury was entirely justified aesthetically. Besides, de Falla's score is a perfect miniature piece that may well prove more hardy than many a grander 20th-century work in years to come. Yet perhaps the most lasting impression was of Handel's Suite No 8 in F minor, played by Malcolm Proud. After a dreamy prelude and robust fugato, the Allemande offered a string of descending phrases as fresh and as beautifully controlled.